I became hooked on traveling while studying in University. The terms could not end soon enough so I could take off to a new destination. It wasn't long until I realized that planning an accessible trip takes a LOT of planning and research. In fact, I often found myself planning one trip before I had even left for another. Each trip involved long hours looking for accessible resources, such as accessible hotels, medical equipment rentals, van rentals, tours, etc. 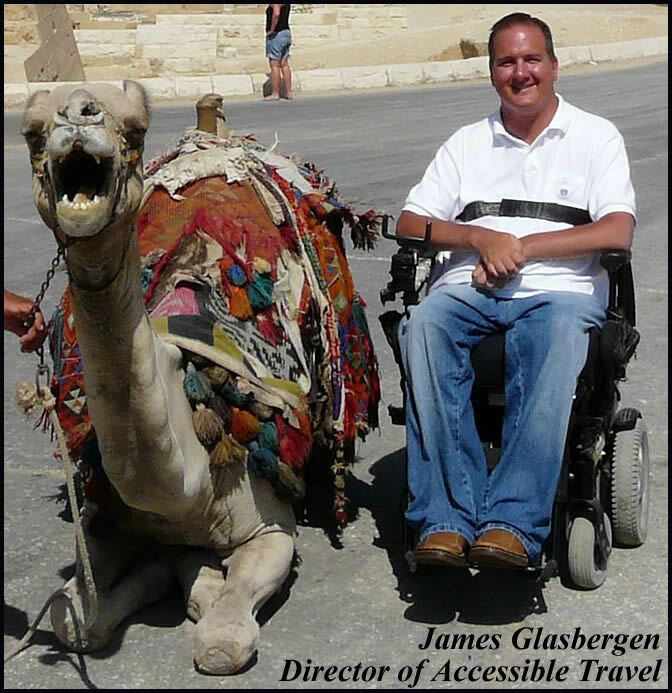 In my research, I came across many accessible travel websites that posted travel tales from people with disabilities. While they were often helpful, I found that many -- if not most -- of the reviews were written by people with more mobility than myself. Many were able to transfer out of their wheelchairs on their own or even walk a few steps, so they had no problem transferring into a car seat or a bathtub, or even folding up their wheelchair and climbing aboard a bus. As an electric wheelchair user with C4 quadriplegia, it was clear to me that their definition of "accessibility" was a lot different than mine. So, I decided to start up my own accessible travel web site complete with travel reviews, pictures, and travel tips that I had picked up in my own travels. I thought my experiences might be useful for all travelers -- those with minor mobility challenges and those who require a higher standard of "accessibility." A few months later, World On Wheelz was born! It wasn't long after I graduated from university that I realized I wanted to be in the travel industry full-time. So, I went back to school for Travel Consulting and then began work at FREDERICK TRAVEL in 2004. Given the obvious need for an agency that specializes in accessible travel and that knows what disabled travelers require, we immediately established an accessible travel department operating under the name World On Wheelz, and we have been making accessible travel arrangements for disabled travelers ever since! Planning an accessible vacation can be a daunting task for many in the disabled community. Would-be travelers are often frustrated by not knowing where to look or how to go about planning an accessible trip. Fortunately, they need look no further than World On Wheelz. We are here to help disabled travelers discover the world and fulfill their dreams! We have established working relationships with tour operators and suppliers all over the world who specialize exclusively in accessible travel arrangements. Whether one's passion is Cruising, an African Safari, or destinations in Europe, Egypt, Israel, Australia, New Zealand, the Caribbean, the United States or Canada, we can make accessible arrangements to suit one's special needs. Our travel experience and first-hand knowledge of accessibility issues will ensure that clients enjoy smooth, hassle-free vacations. We pride ourselves on offering vacations with the highest standard of accessibility! Please e-mail us at info@worldonwheelz.com with any comments, questions, or booking inquiries you may have. We look forward to hearing from you. Don't forget to SIGN THE GUESTBOOK! Copyright © 2003-2015 World on Wheelz. All rights reserved.